I laid out in my 2018 Policy Address a healthcare blueprint running into 28 paragraphs of over 2,400 words. I put primary healthcare at the beginning of that blueprint and announced a government commitment to enhancing district-based primary healthcare services. Indeed, in my speech in the Legislative Council to introduce my Policy Address, I mentioned the resolve to actively promote primary healthcare services to change the present treatment-oriented healthcare system as an example of the Government acting swiftly and boldly on matters which clearly serve the public purpose. Also, expenditure on preventive medical care is often quoted by me as an example of my new fiscal philosophy, that is, making timely investments on preventive measures in order to reduce the extra expenditure which may have to be incurred if action is delayed. Unfortunately, actions to move Hong Kong towards a primary care-led, integrated, person-centred healthcare system that would adequately meet the healthcare needs of our people, as now advocated and substantially justified by the research team, has been delayed, not by a few years, but by almost three decades. In the late 1980s, in anticipation of the setting up of the Hospital Authority to improve hospital services, critics already pointed out that even with better managed hospitals, a hospital-based approach to the delivery of health services was not in the best interest of the community. The imbalance in our healthcare system, in resource allocation and in general emphasis, had to be addressed. Riding on the International Conference on Primary Health Care held at Alma-Ata in 1978, many countries responded positively to the conference declaration that primary healthcare is the key to achieving the target of Health for All by the Year 2000. Hong Kong was no exception. A Working Party on Primary Health Care was established in August 1989 under the chairmanship of a very distinguished medical professor, Professor Rosie Young, and a report entitled Health For all – The Way Ahead was published in December 1990. I found some time out of my extremely hectic schedule over the last few days to re-read parts of the report, which I in my then capacity as Secretary to the working party, helped to prepare. I asked myself what has changed in our healthcare system over these past three decades. It is gratifying to note that Hong Kong’s life expectancy at birth has improved considerably from 74.4 years for males and 79.9 years for females in 1988 to 81.3 years for males and 87.3 years for females, from lagging behind Japan to overtaking Japan. The specialties of family medicine and community medicine have been given due recognition and quality training has been put in place under the Hong Kong Academy of Medicine. New preventive services like the Student Health Service, Well Women Clinics and screening for certain diseases have been introduced. Public health has been significantly strengthened as a result of a series of disease outbreaks and we can now look to the Centre for Health Protection as the vanguard of public safety. Medical vouchers have been introduced for the elderly to help them meet private medical costs. As a result of all these initiatives over the years, government expenditure on primary healthcare has increased both in terms of absolute amount and as a percentage of the total healthcare expenditure – from about 10% in the late 1980s to the present 15%. But the then lamented healthcare scene persists – the concept of primary healthcare as the base of a healthcare system on which rest the more expensive and more specialised medical services has not received adequate attention; its role as the gatekeeper of the hospital by managing patients whose medical conditions do not necessarily require hospital investigation or treatment, has not been fully appreciated; comprehensive care is not prominent and continuity of care is inadequately maintained; doctor-hopping remains common, and some say has been made worse by our medical voucher scheme, and our public hospitals are increasingly overburdened. Against that background, recommendations in Our Hong Kong Foundation’s health system research seem deja vu. Yet this piece of detailed research has, I hope, given our healthcare professions and the community at large, the urgency for action. The research team points out that: nearly half of the hospital admissions are ambulatory care sensitive, that is, they are chronic conditions that do not require hospitalisation if prompt and effective ambulatory or primary care is available; the unplanned admissions rate within 30 days of discharge from hospital is 20%, indicating inadequate support for discharged patients; and for every HK$1 invested into community care, we could save HK$8.4 on acute care costs. At the WHO Global Conference on Primary Health Care in October 2018, the Astana Declaration on Primary Health Care was promulgated. It clearly spells out the essential components of primary healthcare, including the responsibilities of governments and societies in prioritising, promoting and protecting people’s health and well-being, at both population and individual levels, through strong health systems. To achieve this mission, we need to provide enabling and health-conducive environments where individuals and communities are empowered and engaged in maintaining and enhancing their health and well-being, with partners and stakeholders aligned to provide effective support to health policies, strategies and plans. But the mere fact of the issue of this 2018 declaration to remind all governments perhaps reflects that the 1978 Alma-Ata target of Health For All by the year 2000 has been sadly missed. In its report in 1990, the Working Party on Primary Health Care acknowledged that full development of primary healthcare programme is a long-term process. While the principles of primary healthcare are known, the question is how to put them into practice. The working party then recommended a gradual, step-by-step approach. Today, faced with a rapidly ageing population imposing huge care demands, growing aspirations from the public for better service, advances in medical technology making hospital treatment more sophisticated and more costly, and medical manpower facing various constraints, I do not think we have the luxury to progress only incrementally. What we need is a paradigm shift in how the community approaches healthcare, and how the government organises health services. What we need now is passion, conviction and determination. I hope the health section in my 2018 Policy Address and related Policy Agenda has displayed that passion, conviction and government commitment to promoting primary healthcare. First, I am committed to enhancing district-based primary healthcare services which I believe is the key to the right direction. The Food & Health Bureau is now setting up the first district health centre in Kwai Tsing District as I proposed in my Policy Address last year, with a view to starting operation around the third quarter of next year. Operating through district-based medical-social collaboration and public-private partnership, the district health centre will provide a range of services in health promotion, health assessment, chronic disease management, community rehabilitation, hence putting emphasis on all levels of prevention. Second, we envisage that the district health centre will be a service hub that provides services through a network of convenient locations, as we fully acknowledge that convenience and accessibility are of great importance to the public. The district health centre will form a government-subsidised service network engaging medical and healthcare practitioners in the district, which aims to incentivise targeted citizens to identify and manage health issues at an early stage. Chronic diseases and rehabilitation process can in turn be better managed with the help of healthcare services providers in the community. Third, instead of the usual step-by-step approach of waiting for the outcome of the Kwai Tsing pilot before rolling out such district health centres to other districts, I have already authorised the Secretary for Food & Health, as well as the Secretary for Financial Services & the Treasury, to proactively take forward the setting up of district health centres in other districts. We have already identified suitable locations for the district health centre in Kwun Tong and Eastern Districts and are actively exploring suitable sites in the remaining districts. Fourth, we should never forget non-communicable diseases, which is the top killer in Hong Kong. With a view to improving the health of the public and mitigating the burden brought by non-communicable diseases, the Government has taken the lead to develop a comprehensive strategy and action plan for the prevention and control of such diseases, entitled Towards 2025: Strategy & Action Plan to Prevent & Control Non-communicable Diseases in Hong Kong with nine local targets, in May this year. To achieve these targets by 2025, new strategic directions are adopted to accelerate the actions on the diseases reduction agenda. The Government will demonstrate leadership in many ways by working with stakeholders, such as by implementing health promotion interventions and fostering effective partnerships with primary care professionals. Finally, we will take the timely step to incorporate Chinese medicine into the healthcare system in Hong Kong. Given the long history and popular use of Chinese medicine among the local community, it has a lot of potential to assume a more prominent role, particularly in health promotion and disease prevention as well as support for discharged patients. For this, we are pushing ahead with Hong Kong’s first Chinese medicine hospital. Expected to commence operation by phases from late 2024, it will be our flagship Chinese medicine institution offering a combination of in and out-patient services, and will act as a platform for Chinese medicine training, education and research. In pursuing all the above initiatives we need concerted efforts by all healthcare professionals. We have to strengthen cross-sector collaboration as well as public private partnership. We have to innovate and embrace technology, the potential of which has been clearly demonstrated by two editions of the Gerontech Expo, held this year and last year. In playing a leading role in the healthcare transformation, my Government will listen to experts’ opinions and receive continuous feedback. So, ladies and gentlemen, let’s join hands to develop for Hong Kong a healthcare system that is fit for all and fit for purpose. 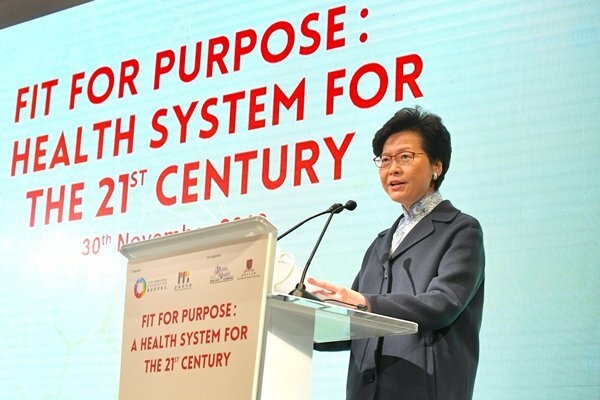 Chief Executive Carrie Lam gave these remarks at the Hong Kong Health Systems Summit organised by Our Hong Kong Foundation on November 30, 2018. Higher education institutions are essential to creating the talent we need to succeed in the global economy. They are also essential in connecting people, institutions, business and governments. That is indeed the case today as we formally welcome one of the world’s most prestigious universities, the University of Chicago and the second-oldest business school in the US, the University of Chicago Booth School of Business, to Hong Kong. The University of Chicago Francis & Rose Yuen Campus will serve as the Asian base for Chicago Booth’s flagship Executive Master of Business Administration (EMBA) Programme. It will, as well, be home to the university’s student abroad programme. I am pleased to note that the complex also features the Hong Kong Jockey Club Programme on Social Innovation. A partnership between the Hong Kong Jockey Club Charities Trust and the University of Chicago, this programme offers a range of opportunities, including scholarships, social entrepreneurship workshops, and training for NGO professionals. Next week, I understand it will host the Global Launchpad, a four-month training programme designed to provide social entrepreneurs with the tools, coaching, and hands-on learning needed to effectively grow their early-stage ventures. Today’s opening underlines my Government’s commitment to strengthening Hong Kong’s status as a regional education hub, and to the internationalisation and diversification of our higher education sector. Our internationalisation measures include expanding quotas for non-local student admission, setting up a Government Scholarship Fund for outstanding local and international students, and allowing students from outside Hong Kong to stay here without limitation for up to 12 months after graduation. As for diversification, we encourage international institutions to set up in Hong Kong through such measures as our Land Grant Scheme, the Quality Enhancement Support Scheme and the Research Endowment Fund. We are glad to see that our efforts have started to bear fruit. This stunning new campus was made possible through our Land Grant Scheme, and will surely be a win-win for both Chicago Booth and for Hong Kong. For Chicago Booth, Hong Kong is an ideal choice for recruitment of quality students in the region given its excellent connectivity, diversity and vibrancy in the city. For Hong Kong, we are pleased to have another world-renowned EMBA programme provider in our city which would help establish Hong Kong as a quality education platform for both local and non-local students. Indeed, 130 EMBA students have enrolled in the two-year programme. They come largely from Hong Kong, but also from all over Asia as well, including India, Indonesia, Japan, Malaysia, Singapore and the Mainland. Mainland students are taking part, I should add, through a pilot scheme introduced with the support of the Ministry of Education of the Central People’s Government. In place since the 2017-18 academic year, it offers Mainland students placement in full-time locally accredited, non-local programmes here. The opening of this new campus also marks the successful completion of a heritage conservation and revitalisation project. The campus, which rises from two heritage buildings, is situated on a historically important site. From the late 1930s, it was part of the British Army’s Jubilee Battery, used in the defence of Hong Kong during the Second World War. Later, it became home to the Victoria Road Detention Centre, known as the “White House”. In 2010, during my term as Hong Kong’s Antiquities Authority in my then official capacity as the Secretary for Development, the compound was accorded Grade 3 historic building status by the Antiquities Advisory Board. And now, we have here a unique landmark reflecting Hong Kong’s architectural traditions and heritage. I understand the public is welcome to enjoy its beauty, and the history that surrounds it, through the Hong Kong Jockey Club University of Chicago Heritage Courtyard & Interpretation Centre. I learnt that guided tours and exhibitions will begin next week. The scenic trail running through and around the site, with its spectacular sea views, will also be open to the public. Chief Executive Carrie Lam gave these remarks at the opening ceremony of the Hong Kong Jockey Club University of Chicago Academic Complex | The University of Chicago Francis & Rose Yuen Campus on November 30. Hong Kong, among the world’s most connected centres – the business bridge between East and West – is one of the best places to do business. Our ranking in World Bank’s latest Doing Business Report has risen from the fifth to the fourth. We are also flourishing as an Asian hub for innovation, technology and entrepreneurship. That includes our startup scene, among the top five fastest-growing and one of the world’s top 25 startup centres. Last year, the number of startup companies here rose to over 2,200, an increase of 16% over the previous year. The establishment of Nordic Innovation House will surely boost those numbers long down the innovation road. To ensure Hong Kong’s primacy as an innovation leader, my Government has placed a policy priority on innovation and technology. Encouraging technology startups is central to that commitment. Hong Kong Science Park, which I understand the Royal Technology Mission visited yesterday, provides significant support to startups. Its incubation programmes offer financial support, subsidised office space and shared facilities, technical, marketing and development assistance and, perhaps most important, access to angel investors and venture capitalists through investment-matching events. Then we have the Cyberport, our ICT (information and communications technology) flagship, which works with digital technology startups in many ways. These include the Cyberport Incubation Programme and Creative Micro Fund and Accelerator Support programmes. Cyberport also features Smart-Space, a co-working space of more than 140,000 sq ft.
To expand on that good work, my Government has allocated an additional US$1.3 billion to Science Park and close to US$40 million to Cyberport recently. Part of that will be used to expand support for their tenants and incubatees. To take the lead in encouraging innovation, we will be introducing a pro-innovation government procurement policy next year. This will involve changes in the tendering and sourcing of goods and services as well as in the tender evaluation. Our doors are wide open and welcoming to entrepreneurs and startups from Nordic countries. And Nordic Innovation House can only accelerate your connections to Hong Kong opportunity. That, ladies and gentlemen, means China opportunity as well, particularly the fast-emerging Guangdong-Hong Kong-Macao Greater Bay Area. 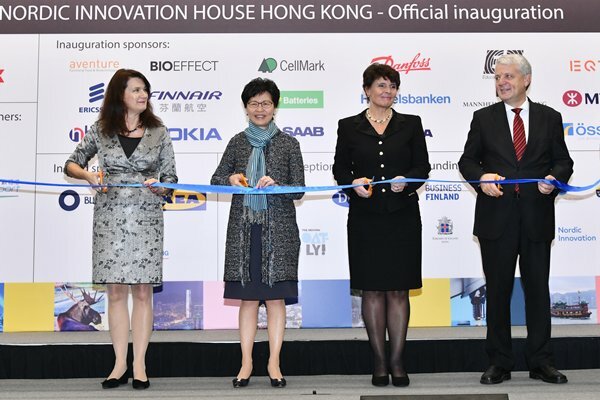 Chief Executive Carrie Lam gave these remarks at the Inauguration of Nordic Innovation House Hong Kong on November 28. Hong Kong is honoured to be chosen as the place for hosting a prestigious group of scientists and experts for the Second International Summit on Human Genome Editing, and I am pleased to welcome you all, especially those coming from the Mainland and overseas. I wish to thank, in particular, Victor Dzau, who first raised the idea of bringing this summit to Hong Kong with me when we met in February this year. He said this summit will no doubt put Hong Kong on the map of human genome editing and strengthen the Hong Kong Special Administrative Region Government’s determination to press ahead with biomedical research in Hong Kong. In 1990, hundreds of researchers from around the world joined forces for what became the world’s largest biological project: determining the sequence of the human genome, identifying all the genes it contains. That landmark endeavour was declared complete in 2003, setting in motion extraordinary advances in the science of human genome editing. It also set in motion a great raft of concerns that led to the inaugural International Summit on Human Gene Editing in Washington, DC, three years ago. If the technology has continued to accelerate since that 2015 summit, so, too, have the concerns about the science, ethics, application and governance of human genome editing that must be addressed. This is I believe a subject that will be thoroughly deliberated during the course of this second summit. Renowned scientists and researchers, technology experts and policymakers, ethicists, patient advocates and many others are here to connect with one another, to discuss and debate the potential benefits and risks of human genome editing, and to consider how to incorporate the societal views into regulations formulation and policy consideration. Allow me to say, Hong Kong is an ideal place for holding this summit, given our goal to become an international innovation and technology hub, an ambition with strong support from the Central Government. And biotechnology, I’m pleased to note, is among the key areas we are focusing on. Our strategy to develop innovation and technology in Hong Kong comprises key elements such as increase in R&D funding, nurturing of local talents as well as admission of non-local talents, development of a cluster of research centres, opening up of health data for research purposes, etc. Detailed initiatives were outlined in my inaugural Policy Address delivered last October, and a recent one last month. You can find some of that information in the booklet in front of you, called Innovation Hong Kong. In total, some $78 billion, or US$10 billion, has been allocated for innovation and technology development through these two Policy Addresses. On health technology, we will be establishing a research cluster in the Hong Kong Science Park. We will invite world-class scientific research institutions and technology enterprises to join this cluster, to work with our local universities and research institutions on R&D projects. In this connection, we signed earlier this month a Memorandum of Understanding with the Chinese Academy of Sciences, which will establish an affiliated institution in Hong Kong with a view to facilitating its Guangzhou Institutes of Biomedicine & Health to join the research cluster. In addition, France’s Institut Pasteur, where I visited in Paris in June this year, has also indicated interest in joining the cluster in collaboration with the Hong Kong University medical school. I anticipate that the first scientific research institutions to establish laboratories in the health technology cluster will get going within the next year. Noting that genome medicine has huge potential in screening, diagnostics and precision medicine, I announced in my Policy Address last year the establishment of a steering committee to lead the study on strategies for developing genomic medicine in Hong Kong. The steering committee has put forward a recommendation to conduct a large-scale genome sequencing project in Hong Kong in order to enhance the clinical application of genomic medicine. The project also aims to promote innovative research on genomic medicine to cater for future medical development in Hong Kong through the establishment of genome data of local population, testing infrastructure and talent pool. I have accepted the steering committee’s recommendation and promise to provide government funding for the purpose. Funding aside, good research is only possible with data. I am pleased to announce that the Hong Kong Hospital Authority is preparing a Big Data Analytics Platform. It will allow researchers to access its invaluable clinical data for the purpose of further healthcare-related research. We expect this platform to be ready before the end of this year. All these recent developments make the hosting of the Second International Summit on Human Genome Editing in Hong Kong so very relevant and timely. We welcome all of you to join us in our work to transform Hong Kong into an international health technology hub and to bring significant benefits to mankind. 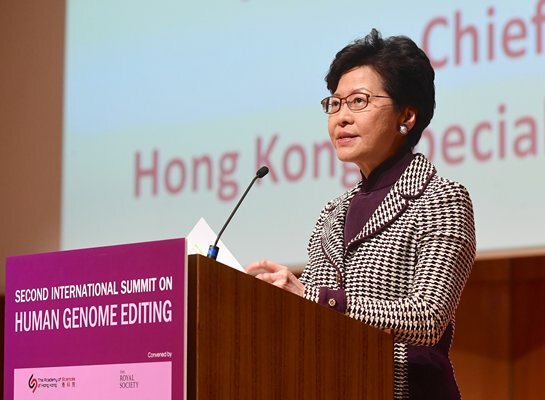 Chief Executive Carrie Lam gave these remarks at the Second International Summit on Human Genome Editing held at the University of Hong Kong on November 27. At last count, more than 8,700 overseas and Mainland companies maintain an office in Hong Kong. Among them, 1,530 have chosen to set up regional headquarters here, representing an increase of 8% over a year ago. Meanwhile, Hong Kong’s ranking in the World Bank’s latest Doing Business Report has risen from the fifth to the fourth. That is testimony to Hong Kong’s business-friendly environment, from our simple and competitive tax regime to the level playing field we offer all business, whatever they do and wherever they come from. No less important, business works best when government is small and the environment encouraging. Hong Kong, built on free enterprise, inspires business confidence. 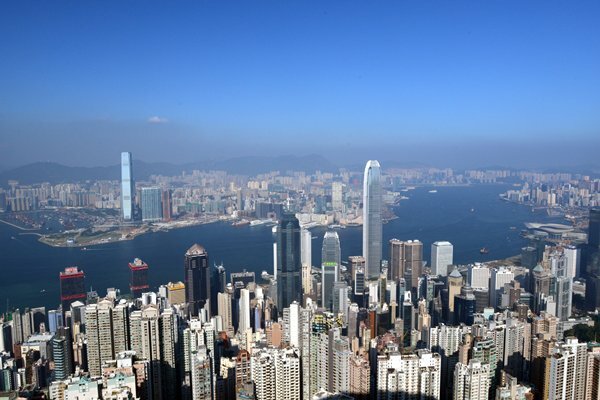 As J P has just noted, the Washington-based Heritage Foundation has named Hong Kong the freest economy in the world for the past 24 years in its annual Index of Economic Freedom report. In explaining our top ranking, the Heritage Foundation said of Hong Kong, and I quote, “an exceptionally competitive financial and business hub” with “little tolerance for corruption”, adding that “a high degree of transparency enhances government integrity”. I do like those words, and what they say about Hong Kong. And I’m determined that my Government will continue to live up to them. What makes Hong Kong unique is more than our business environment, as enabling as it may be. Our singular strength is the “one country, two systems” framework Hong Kong enjoys under the Basic Law. We will continue to take full advantage of this fundamental strength while at the same time play a more proactive role in functioning as a “facilitator” and a “promoter” and striving to expand our connections with the world. A little over a week ago, I attended this year’s Asia-Pacific Economic Cooperation Economic Leaders’ Meeting in Port Moresby, Papua New Guinea, and met with a number of leaders. It was my 11th overseas trip and the 12th country visited since I took office last July. All these trips have been fruitful, allowing us to tell the world about the successful implementation of “one country, two systems”, to explore new markets and to raise Hong Kong’s profile in the world. Less than two weeks ago, we concluded negotiations on a free trade agreement and a related investment agreement with Australia. That agreement and another with the Maldives which has also been concluded bring the number of free trade agreements we’ve signed or are about to sign to nine, involving 21 global economies. And in January next year, our free trade agreement with the Association of Southeast Asian Nations, signed last November, will begin to take effect. Opportunities brought by “one country” are all but boundless, thanks to the Belt & Road Initiative and the Guangdong-Hong Kong-Macao Greater Bay Area. This Greater Bay Area, encompassing Hong Kong, Macao and nine cities in Guangdong Province, will create an enormous regional economy, one boasting nearly 70 million people and a GDP worth US$1.5 trillion. The infrastructure connecting Hong Kong to the Greater Bay Area is world-class, with the opening of the Hong Kong-Zhuhai-Macao Bridge last month and the commissioning of the Hong Kong Section of the Guangzhou-Shenzhen-Hong Kong Express Rail Link in September. The Belt & Road Initiative, designed to boost connectivity between the Mainland of China and countries spanning three continents, also offers unparalleled opportunities for Hong Kong business. Our financial and professional services sector, in particular, stands to gain, given the overwhelming need for investment capital that big-ticket infrastructure development demands. We are also committed to promoting Hong Kong as an international dispute resolution centre for the Belt & Road, as I noted in my Policy Address in October. Our plans include developing a Belt & Road Dispute Resolution Centre, providing a wide range of services to resolve cross-border disputes. 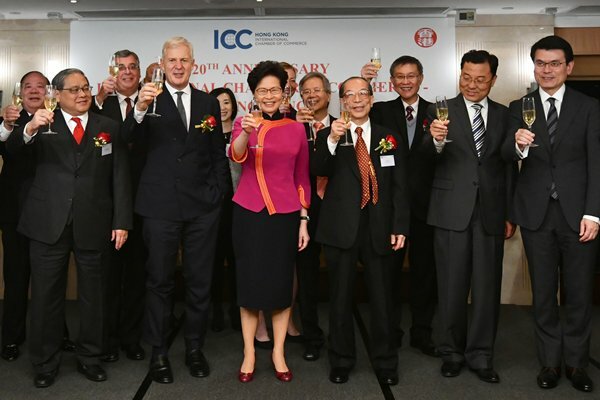 Chief Executive Carrie Lam gave these remarks at the International Chamber of Commerce – Hong Kong’s 20th Anniversary Reception. We are happy to learn that the World Men Championships, a prestigious international bowling event for years, is held for the first time in this small but vibrant and dynamic city. I am also glad to know that the tournament has been awarded the “M” Mark, or Major Sport event, status and attracts about 300 top-flight bowlers from far and wide to compete for honours here, offering our local community a front-row seat to world-class bowling action at the highest level. 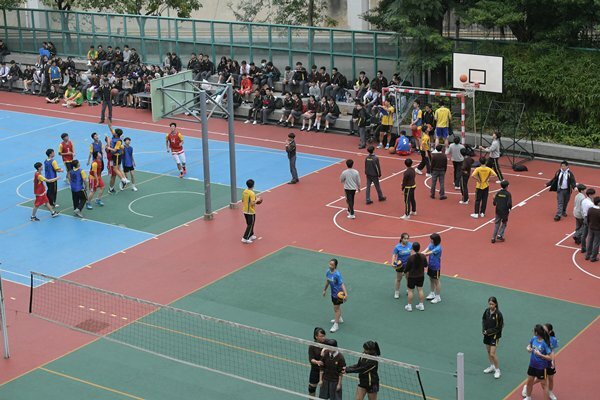 As with other major metropolis in the world, the development of sports in Hong Kong goes hand in hand with the city’s progress and prosperity. It is always our policy here to promote sports in the community and make Hong Kong a leading location for major international sports events. In this connection, our Government announced in its Budget this year an allocation of $500 million to the Major Sports Events Matching Grant Scheme to enhance the provision of existing matching grant under the “M” Mark System. The purpose is to encourage the business sector to sponsor large-scale sports events, thereby providing our athletes with more opportunities to compete in high-level competitions on home ground. As for the community, we are also making substantial investments in upgrading local sports infrastructure such as the development of the Kai Tak Sports Park, which is the former Kai Tak Airport actually, and the implementation of 26 projects under the Five-Year Plan for Sports & Recreation Facilities. The Kai Tak Sports Park will provide a wide variety of sports facilities, including a bowling centre with 40 lanes. On its completion, more mega bowling competitions are able to be staged in Hong Kong. We are confident that, with these extra resources in place, we will be able to continuously enhance the image of Hong Kong as a sports centre in Asia, promote a healthy lifestyle, encourage social interaction and foster a strong sense of community identity among our citizens. Chief Secretary Matthew Cheung gave these remarks at the 2018 CGSE · Million Tinkle World Men Championships on November 24. The Social Enterprise Summit is a flagship event to demonstrate the cross-sector collaboration among social enterprises, NGOs, charities, businesses, investors, academics and government to promote social innovation and entrepreneurship. Since its inception in 2008, the summit has become a highly acclaimed annual fixture attracting thousands of participants every year from Hong Kong, Mainland China and the Asia Pacific region. This year, over 3,000 participants from the region have gathered in Hong Kong to explore and discuss future directions and trends of social innovation and social entrepreneurship development under the theme Innovating for a Happier Society, which echoes well with the aspiration of social innovation. Social innovation puts emphasis on addressing social issues through innovation, improving people’s quality of life and seeing the community growing happily together. It covers advancement in knowledge, products and services, including the application of existing business models, processes and methods in new ways to meet social needs. Social innovation has a proven track record in addressing social issues both locally and internationally, and has been gaining public attention and recognition these days. Initiated by individual social entrepreneurs, social innovation is often put into practice by cross-sector collaboration involving corporates, NGOs, philanthropies, impact investors, academia and the government. To foster social innovation in Hong Kong, the Hong Kong Special Administrative Region Government launched the Social Innovation & Entrepreneurship Development Fund (SIE Fund) in 2013. The SIE Fund seeks to act as a catalyst for promoting social innovation in Hong Kong. By supporting cross-sector collaboration and capacity building, the SIE Fund aims to foster an ecosystem that enables social entrepreneurs to thrive; support innovative ideas, products and services to help alleviate poverty and promote social inclusion; and enhance the well-being and cohesion of society. To date, the SIE Fund has allocated more than $140 million in funding for about 160 projects, expecting to benefit more than 100,000 persons and 1,000 households. Over 2,800 social entrepreneurs have been nurtured by the fund. This year, the fund is bringing to the summit a social innovation exhibition which showcases the latest accomplishments and the upcoming initiatives of the fund. Given the multitude of social issues in Hong Kong, the Government sees the importance of fostering more extensive cross-sector collaboration to drive greater impact and achieve meaningful and sustainable solutions to complex social problems. While the SIE Fund works in close concert with relevant sectors to explore the new approaches to social innovation, I am glad to note that the Social Enterprise Summit also brings together world-renowned leaders, social entrepreneurs, scholars and practitioners to share with us the latest trends and developments in these areas. The development of social enterprises in Hong Kong has been most encouraging. They offer solutions and pioneering innovative projects to alleviate social problems through cross-sectoral collaboration. A shining example is the Community Housing Movement launched by the Hong Kong Council of Social Service with the support of the Government and cross-sectoral collaboration among the Community Chest of Hong Kong, the SIE Fund, kind-hearted landlords, NGOs and social enterprise to provide short-term relief for individuals or families with proven need of transitional housing. The HKSAR Government firmly believes that the continuous development of social enterprises will bring enormous social good to the long-term development of Hong Kong. Indeed, the Home Affairs Bureau of the HKSAR Government has been the major sponsor of the Social Enterprise Summit since the year 2008. We also provide startup funds, improve support platforms to promote cross-sectoral collaboration and strengthen capacity building of social enterprises. We also review the leasing arrangements for government properties to facilitate NGOs and social enterprises to lease and use suitable government properties. The SIE Fund will also bring to this year’s summit a social innovation exhibition which showcases the latest accomplishments and the upcoming initiatives of the fund. While the Government will continue to develop a social innovation ecosystem, nurturing innovative ventures and fostering social entrepreneurs, we need long-term commitment and active participation from all stakeholders, all sectors of society to help social enterprises to thrive and shine. I am pleased to note that the Social Enterprise Summit 2018 brings together relevant sectors and global experts from the UK, the US, Australia, Thailand, Japan, South Korea and Singapore to share their insights and experience in tackling bottlenecks and making breakthroughs in social entrepreneurship development with a view to empowering everyone to create a happier society. 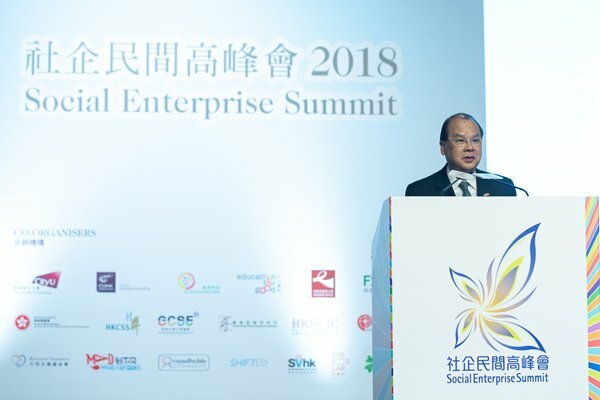 Chief Secretary Matthew Cheung gave these remarks at the Social Enterprise Summit 2018 grand opening on November 22. The vision of the W F Joseph Lee Primary School to develop students to their fullest potential and become responsible and respectable future members of society is consonant with the current-term Government’s mission to nurture the future generations into quality citizens who are socially responsible and equipped with a sense of our national identity, a love for Hong Kong and an international perspective. Government expenditure on education is therefore the most meaningful investment for our future. It has always been the lion’s share of recurrent spending of the Hong Kong Special Administrative Region Government. In the current financial year, our expenditure on education amounts to approximately $113.7 billion, an increase of 28.4% from $88.5 billion in the previous financial year. This fully reflects the long-term commitment of the Government to education. To better prepare our next generations for the challenges ahead, we have allocated considerable resources to promote the whole-person development of students. All along, the Education Bureau has been advocating the adoption of diversified learning inside and outside the classroom to boost students’ interest in learning, and instil in them positive values and attitudes. To this end, the Policy Address this year announced the launch of a new recurrent Life-wide Learning Grant with an annual provision of $900 million. The grant will support public sector schools and schools under the Direct Subsidy Scheme to take forward, on the present foundation, life-wide learning with enhanced efforts through organising more out-of-classroom experiential learning activities in various curriculum areas such as the humanities, STEM education, physical and aesthetic development and moral and civic education. I share the excitement and exhilaration of the teachers and students of this school over the grand opening of the Sports & Arts Building today. I am confident that building on its strengths and foundation, the school would fully utilise the enhanced facilities and the increased resources from the Government to further promote the whole-person development of students. With the concerted efforts of all the stakeholders, I trust that the school will continue to fulfil its mission of developing students as confident, innovative and resourceful individuals with broad horizons and positive thinking. Chief Secretary Matthew Cheung gave these remarks at the opening ceremony of the Sports & Arts Building at W F Joseph Lee Primary School on November 22. In the global business of logistics, connections are critical. The more connections your logistics sector has, the more complex and interrelated they are, the more effective it will be. In that regard, Hong Kong is truly blessed. Thanks to “one country, two systems”, we enjoy ever deeper transport and logistics connections to Mainland China and to the opportunities therein. Thanks to that same system, we also continue to build our ties with the world. Together, those singular connections make Hong Kong excel in the global business of logistics. They make our partners excel too. Consider this morning’s keynote speaker, the Secretary-General of the Association of Southeast Asian Nations. ASEAN, as a group, is our second-largest trading partner. We signed a free trade agreement and related investment agreement one year ago this month, which will begin to take effect in January next year and will surely boost our trade, our investment and our overall connectivity. I am sure the Secretary-General will agree with me when I say that relations between ASEAN and Hong Kong have never been better, never more promising than they are now. The agreements show that Hong Kong and the ten member states of ASEAN believe in free trade, and in the mutual rewards trade and logistics can bring to our economies, our companies and our peoples. As we all know, free trade is taking something of a thrashing these days, given the rising undercurrent of unilateralism and protectionism. Let me assure you, ladies and gentlemen, that for Hong Kong, the primacy of free trade is immutable. I am pleased to say that we have successfully concluded free trade agreement negotiations with Australia just a few days ago. It’s thanks to free enterprise and our ability to adapt to the changing market that has made Hong Kong one of the world’s leading trading economies, and a leading international financial and logistics centre. Indeed, trading and logistics is one of our four pillar industries. It contributes 22% of our GDP and accounts for some 19% of Hong Kong’s total employment. Our trade value amounts to more than three times our GDP, standing today at about US$1.06 trillion. Hong Kong’s local market may be modest, but our ability to serve and create markets, to trade in goods and services with the world, is inexhaustible. For that, we can thank our formidable foundation for international trade. I’m talking about world-class infrastructure, superb connectivity, an unbeatable location at the heart of Asia and the gateway to the Mainland. I’m talking about our institutional strengths, as well as an abundance of talent in a wide range of professional services and business sectors. Our foundation is buoyed by our expanding investment in infrastructure and transport networks. These connect Hong Kong with hundreds of destinations throughout Asia and around the world. Hong Kong today is home to one of the world’s busiest transshipment container ports. Serving about 320 liner ships a week, it’s linked to more than 470 ports worldwide. Last year, Hong Kong Port’s throughput stood at 20.8 million TEUs which accounts for 4% of the throughput of Asia, up 5% over the previous year. Our Shipping Register is the world’s fourth largest, with a gross tonnage of more than 120 million. In short, we will continue to be a key maritime player in the Asian region. We are a force to be reckoned with in the air as well. Our airport has been the world’s busiest in international air cargo for the past 22 years in a row, serving an ever-growing demand for high-value logistics in the Asia-Pacific region. Hong Kong enjoys Air Services Agreements with 67 countries. Our airport handles more than 1,100 flights daily to over 220 destinations, including some 50 Mainland destinations. Last year, we moved 5 million tonnes of cargo and air mail, and handled 73 million international passengers. To enhance capacity, we are building the third runway for our airport. Upon completion, the Hong Kong International Airport will be capable of handling 100 million passengers and 9 million tonnes of cargo annually. The third runway will be in operation by the end of 2022, while the entire three-runway system, including all upgraded facilities, is expected to commission by the end of 2024. The Hong Kong International Airport is located on Lantau, our biggest island which is now serving as a double gateway. Apart from connecting Hong Kong to the world through our airport, Lantau is also linking Hong Kong to other cities in the Guangdong-Hong Kong-Macao Greater Bay Area, which comprises Hong Kong, Macau and nine affluent cities in the Guangdong Province. Together, the Greater Bay Area has a population of 70 million and a combined GDP of US$1.5 trillion. Enhancing connectivity between Hong Kong and the Greater Bay Area is a central policy commitment of my Government. The recent commissioning of this mega Hong Kong-Zhuhai-Macao Bridge has given us a huge boost. The world’s longest combined sub-sea tunnel and bridge, a piece of world-class infrastructure, it has sharply cut travel time to the Mainland cities on the Pearl River’s west bank. For example, thanks to this new bridge, the journey between Hong Kong International Airport and Zhuhai, one of southern China’s fastest-growing cities, has been reduced from four hours to just 45 minutes. This will surely attract time-sensitive, high-value goods to the bridge and, from there, to the rest of the world through the Hong Kong International Airport. Let me add that the time needed to travel from Zhuhai to our container port in Kwai Chung is also reduced from 3.5 hours to 75 minutes. Last month, my Government unveiled long-term plans to reinforce the role of Lantau. Among the planned developments is a Premium Logistics Centre, with a built-up space of some 380,000 square metres which will allow us to capture the opportunities presented by the fast-emerging retail revolution. The centre, relying on robotics and automation, will be able to process 1.7 million tonnes of cargo a year when it opens in 2023. Challenges generally come hand in hand with opportunity. Today, developed economies, Hong Kong included, must contend with long-term labour shortages, a reflection of our ageing population. And then there’s e-commerce, its continuing growth fuelling an insatiable demand for faster and faster small-parcel shipments. Automation and artificial intelligence can meet these challenges. Indeed, robotics, automated ports and blockchain technology are transforming logistics, increasing handling capacity and expanding efficiency. Every one of us in the logistics industry in general must embrace these innovations. Innovative technology without innovative talent will surely fail to deliver on its outsized promise. That’s why, in 2014, we set up the Maritime & Aviation Training Fund. It offers a wide variety of training schemes, providing scholarships and other initiatives to boost talent intake in both sectors. More than 6,200 students and industry practitioners have benefitted from the fund to date. To sustain the momentum, I announced in my Policy Address last month that the fund would receive an additional US$25 million. Our logistics connectivity extends to the industry services on offer. Hong Kong’s 800 shipping-related companies present a flotilla of maritime services. They include ship agency and management, broking and chartering, finance, marine insurance, and maritime legal and arbitration services. Many of the world’s logistics giants call Hong Kong home. 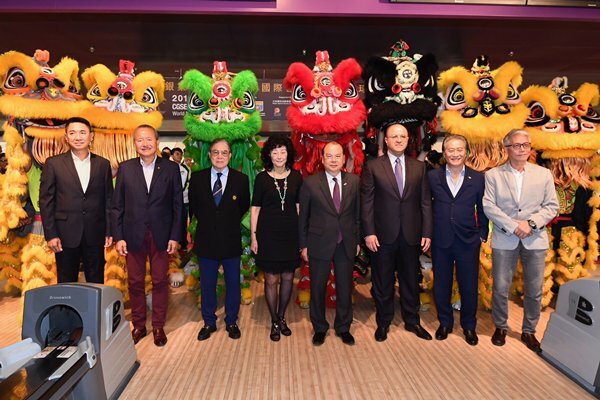 They are joined by over 8,700 Mainland and overseas companies from various sectors which have established a presence in Hong Kong, among them over 1,500 are regional headquarters and some 2,400 are regional offices. The world is here because Hong Kong is Asia’s most connected city – the multilateral, multilayered business bridge linking Mainland and global opportunity. The logistics and maritime sector, like every other sector, industry and business, looks to Hong Kong to build a rewarding future. I encourage all of you to join us, to connect and excel right here in Asia’s world city. 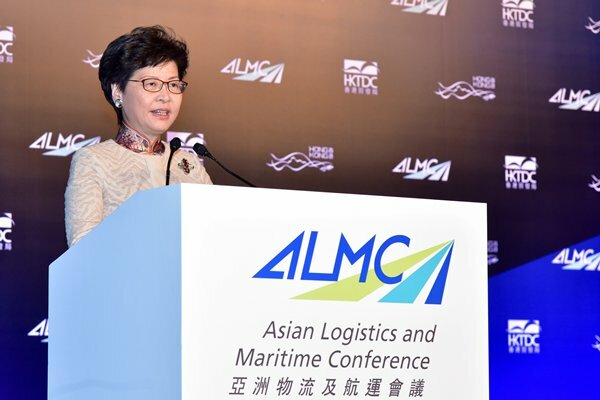 Chief Executive Carrie Lam gave these remarks at the Asian Logistics & Maritime Conference on November 20. Currently, the HKSAR Government has commissioned International Social Service (ISS) Hong Kong to operate a number of programmes for new arrivals from the Mainland and ethnic minorities. For example, the Home Affairs Department has commissioned ISS Hong Kong to operate a support service centre for ethnic minorities, a mobile information service team at the airport and ambassador schemes for ethnic minority families and youths, as well as expectation management programmes for prospective migrants from the Mainland. We thank ISS for being a long-standing staunch supporter of the Government in this respect and provide services to over 40,000 new arrivals from the Mainland and 160,000 ethnic minorities each year. ​Hong Kong is a multicultural city where people from all over the world are welcomed with open arms. Vibrant ethnic minority communities form an integral part of the Hong Kong community. While we may be of different ethnicity, speak different languages or have different traditions, we all call Hong Kong home and work tirelessly to make it a better place to live, work and nurture our future generations. ​Given the diverse needs of our ethnic minority communities, the HKSAR Government has set up a Steering Committee on Ethnic Minorities Affairs, chaired by myself as the Chief Secretary, to enhance cross-bureau collaboration and announced a series of new measures to strengthen support for ethnic minorities. To help our ethnic minority groups to integrate into society, breaking the language barrier is the key to success. To this end, the Education Bureau will provide more funding to schools admitting non-Chinese speaking students to support their learning, particularly the Chinese language. The Labour Department will enhance support for ethnic minority jobseekers through a case management approach to help them move up the social ladder. The Social Welfare Department will commission non-governmental organisations like International Social Service Hong Kong to proactively reach out to the needy and connect them to mainstream welfare services. The Home Affairs Department will enhance the services of its support service centres, including interpretation and translation services, and organise more district-based activities to encourage interaction and exchange between the ethnic minorities and local communities. ​I have cited all these examples in order to demonstrate the Government’s determination and commitment in creating an equal and caring society in Hong Kong. We also count on the support of District Councils and non-governmental organisations to connect the stakeholders and maintain momentum in the community. 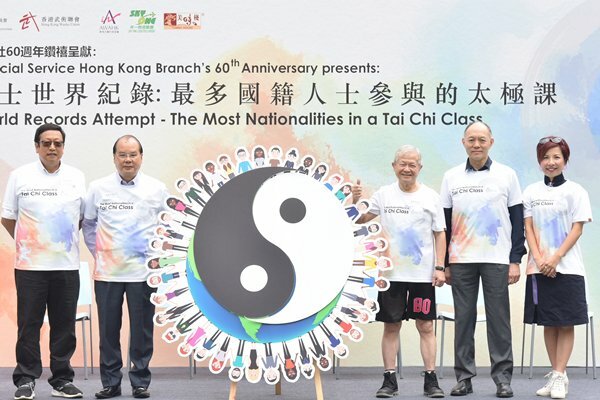 Chief Secretary Matthew Cheung gave these remarks at the International Social Service Hong Kong Branch’s 60th Anniversary presents: Guinness World Records Attempt: Most Nationalities in a Tai Chi Class on November 18.